(Vancouver, October 1, 2014) Balmoral Resources Ltd. (“Balmoral” or the “Company”) (TSX: BAR; OTCQX: BALMF - http://bit.ly/1iUP9nS ) reported results for on-going testing of the Horizon 3 nickel-copper-PGE discovery on the Company’s wholly owned Grasset Property in Quebec. 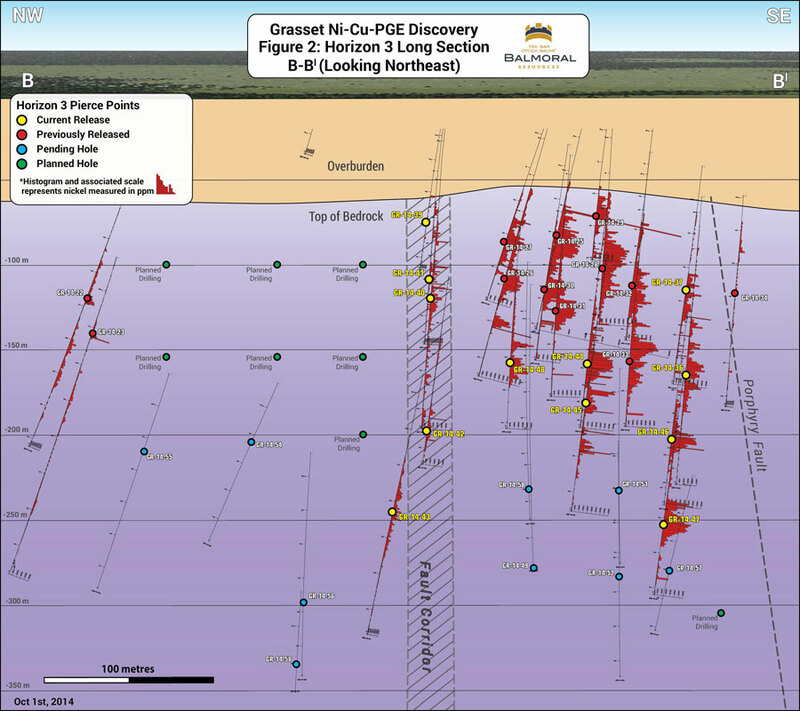 Drilling continues to rapidly expand the size of the Ni-Cu-PGE mineralized zone. Results from 12 recently completed holes, and several pending intercepts, imply more than a doubling of both the strike and down-dip extent of the Horizon 3 discovery. The Horizon 3 sulphide zone remains open to depth and to the northwest (see Figure 1). The Company also reported the first intersections of high-grade “Footwall-Style” Ni-Cu-PGE-Au veining, reported that it has intersected massive sulphide mineralization in three recently completed holes and reported several high-grade gold intercepts from altered volcanic and intrusive rocks in the hanging wall to Horizon 3. Today’s results were highlighted by holes GR-14-44 and GR-14-47, the latter being the deepest intercept reported to date. Hole GR-14-44 returned a 44.87 metre intercept grading 1.53% nickel, 0.16% copper, 0.37 g/t platinum and 0.86 g/t palladium with a higher grade core returning 12.57 metre grading 2.91% Ni, 0.44% Cu, 0.74 g/t Pt and 1.84 g/t Pd. Hole GR-14-47 returned a similarly broad intercept returning 49.25 metres grading 1.28% Ni, 0.13% Cu, 0.31 g/t Pt and 0.76 g/t Pd, which includes a high grade core of 21.89 metres grading 2.21% Ni, 0.23% Cu, 0.57 g/t Pt and 1.42 g/t Pd (see Figure 2 and Figure 3). No Significant Results - Eroded? Reported drill intercepts have traced the Horizon 3 discovery to a vertical depth of 250 metres and for a minimum of 125 metres along strike. On-going drilling has successfully intersected disseminated, net textured and lesser massive sulphide mineralization along Horizon 3 Zone to vertical depths of over 300 metres, below which it remains open. Pending holes are interpreted to extend Horizon 3 along strike for approximately 350 metres with it remaining open to the northwest. The Horizon 3 sulphide zone can be traced from the Porphyry Fault in the southwest, through the recently identified fault corridor (see Holes 39-43, see below and Figure 2) northwest to holes GR-14-22 and -23. The area southeast of the Porphyry Fault (see Figure 2) remains to be tested for Horizon 3 style mineralization pending receipt of a recently completed airborne survey. Reported holes 37 and 44 each intersected “Footwall-Style” veining characterized by strongly elevated copper and precious metal grades. This style of veining is a common feature of magmatic nickel-copper-PGE systems. The best known examples of this Footwall vein and vein breccia mineralization occur in the Sudbury region of Ontario where similar vein sets and related breccia bodies locally form very high-grade copper-precious metal rich orebodies. 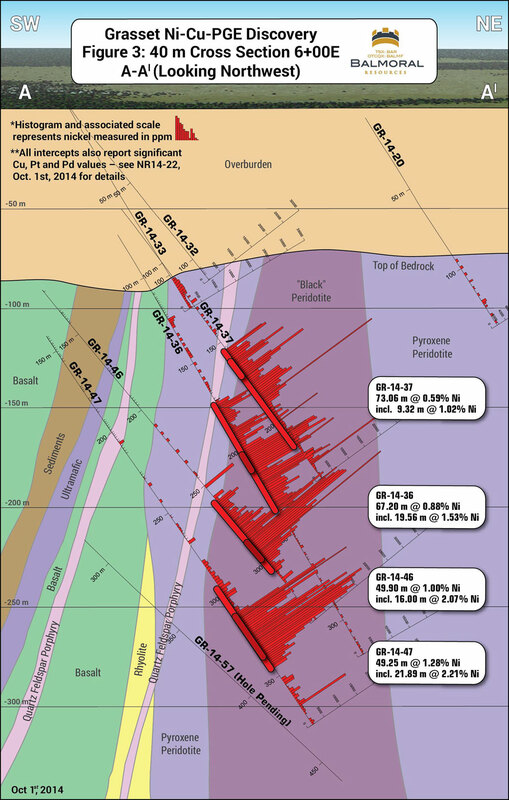 The footwall vein in GR-14-37 is the best example to date of this style of mineralization at Grasset, returning an intercept of 2.58% nickel, 2.90% copper, 1.92 g/t platinum, 12.00 g/t palladium and 5.13 g/t gold over 0.62 metres. The northwestern-most drill section reported today, which features holes GR14-39 to -43, intersected what is interpreted to be a near vertical, potentially east-west trending, corridor of faulting and mafic dyking which locally disrupts Horizon 3. The Horizon 3 mineralized zone is present in all holes along this section, save for the shallowest hole (GR-14-39) where it may have been removed by erosion. Hole GR-14-43, the deepest, and most northwesterly hole on this section, displays significantly less disruption and a mineralized sequence/textures similar to those observed southeast of the fault. Subsequent drilling has confirmed the continuation of the Horizon 3 sulphide zone across this fault corridor with only minor horizontal offset (see below) across the corridor. Additional, closer spaced drilling will be required to determine the extent of the area disturbed by this corridor. High-grade gold mineralization, developed in sheared and strongly altered volcanic rock in the hanging wall (SW) to, or within the uppermost portion of, the Grasset Ultramafic Complex (“GUC”) was intersected in three reported holes (see Table 2 below). Gold mineralization occurs in quartz+/-carbonate veins within a sequence of sericite-carbonate-fuschsite-silica altered mafic and felsic volcanic rocks immediately in the hanging wall to GUC or in isolated quartz-carbonate-talc veins cutting the GUC. Similar high-grade gold mineralization occurs at the Company’s Fenelon gold zone located 6 km to the west of the area currently being tested where it also associated with an ultramafic sill. GR-14-35 (which was lost at shallow depths) and GR-14-38 were collared in the extreme southeast portion of the GUC, approximately 100 metres northwest of discovery hole GR-12-09, to test a conductive feature identified by the Company’s 2011 airborne survey and subsequent ground work. 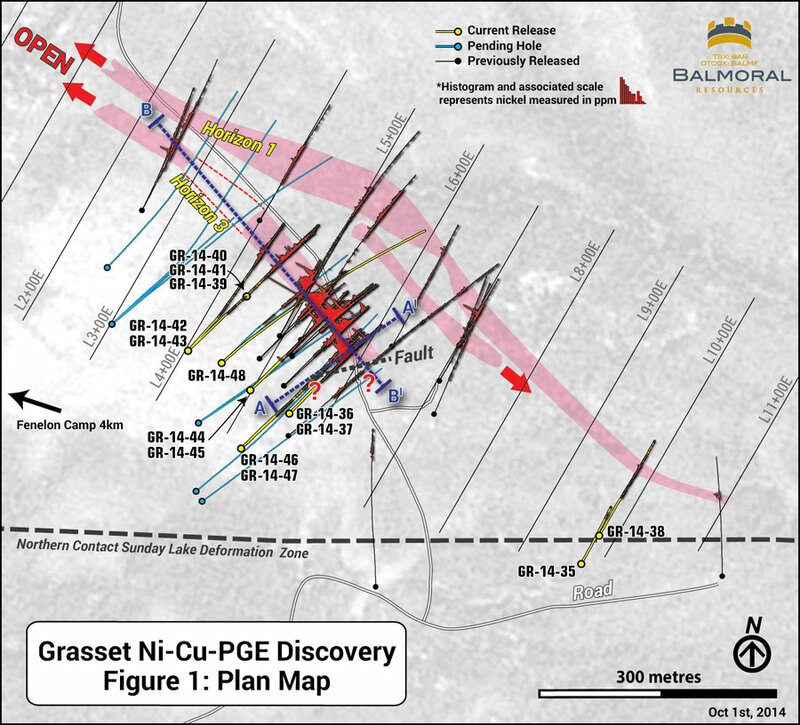 Hole GR-14-38 successfully intersected Ni-Cu-PGE mineralization along Horizon 1 of the GUC (8.32 metres grading 0.42% Ni, 0.04% Cu, 0.08 g/t Pt and 0.19 g/t Pd) but no conductive source was identified. Additional work to source the targeted conductor will be postponed until results of the recently completed 2014 airborne survey, which was conducted in greater detail than the 2011 survey, are received. An additional 13 holes have now been completed and two drills continue to turn at Grasset. On-going drilling has continued to successfully intersect Horizon 3 mineralization to depth and to the NW of the 39-43 fault corridor. Holes 51, 56 and 57 have intersected semi-massive to massive sulphide intercepts of 0.45, 0.82 and 1.50 metres respectively. Each of the massive sulphide intercepts is associated with much broader zones of disseminated to net-textured sulphide mineralization. These represent the first intercepts of massive sulphide mineralization along Horizon 3 since discovery hole GR-14-25 (0.62 metres grading 14.35% nickel, 0.51% copper, 2.32 g/t platinum and 6.70 g/t palladium; see NR14-11, May 20, 2014). Photos from the massive sulphide intercept in hole GR-14-57 and a particularly strong interval of net-textured sulphide from hole GR-14-54 are available on the Company’s website at www.balmoralresources.com. It is anticipated that the current phase of drilling will be completed prior to the end of October and that the winter drilling program will commence once ground conditions permit.